Sometimes Americana doesn’t have to be American-made. That’s the case with Gem, a small line of English dinnerware by Hammersley. 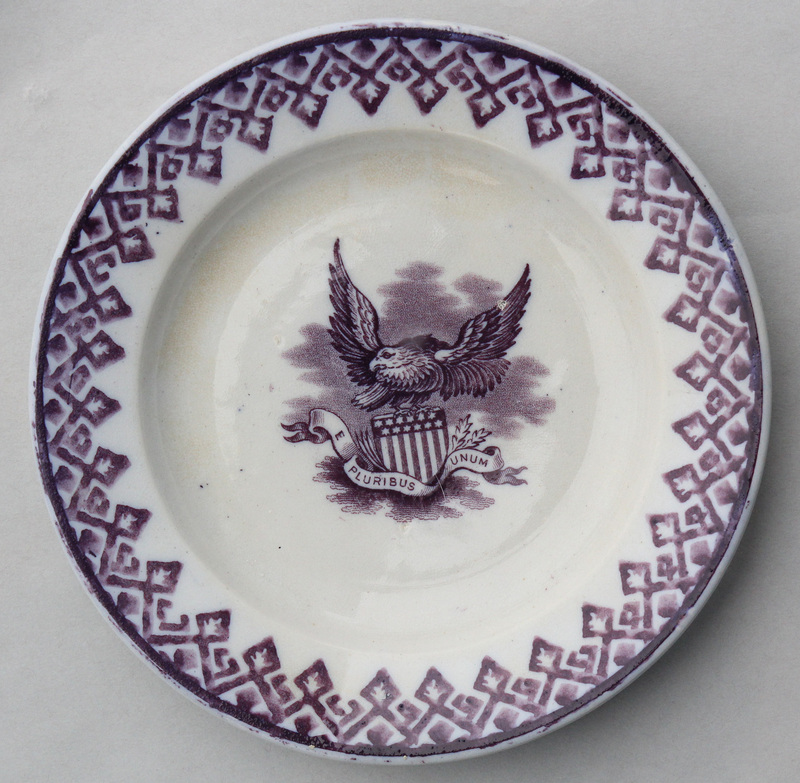 The example I added to my collection last year, and which now sits on a shelf above my desk, is a 6.5-inch plate having a mulberry transfer print of an American eagle atop a Federal shield over a banner lettered “E Pluribus Unum.” The edge of the plate has a geometric design in stick sponge, also in purple. The backmark shows the maker’s name, pattern name and a registry mark. Ralph Hammersley made pottery in the Staffordshire district of England from 1860 to 1863. During the 1861 census, he was 30 years old, married, had two sons and a daughter, and employed a 17-year-old servant. Twenty people worked at his earthenware business — 11 men, four women, three girls and two boys. Business must have been good. The company was renamed Ralph Hammersley & Son in 1864, reflecting a new family partnership. By 1871 the pottery’s workforce had grown to 200. Gem, which was registered on April 23, 1868, was created for export to the American market. Although it’s not a rare design — examples have sold at numerous auctions in recent years — the motif is far from common. My plate varies from most others due to the use of mulberry. Blue is the color typically found. The plate represents a transition from handwork to transfer designs. The central transfer of the eagle and shield was relatively easy to apply, allowing manufacturers to create uniform decorations at a rapid rate. The stick-spatter border around the edge, however, was more time-intensive. A sponge having a design cut on the end was attached to a stick, dipped in glaze and dabbed inside the rim. Values for Gem, which is sometimes referred to as Eagle & Shield, can vary greatly. Items sold at live auctions, according to Prices4Antiques.com, have included four handleless cups and saucers in blue for $356 the set and eight 8.75-inch plates in blue for $593 the set, both offered at Skinner in March 2011; 7.75-inch plate in mulberry, $130 at Horst Auctioneers in September 2007; oval vegetable bowl in blue, 6 by 7.5 inches, $330 at Conestoga Auction Company in September 2000; and an oval platter in blue, 10 by 13.5 inches, was $302 at Garth’s in September 2000. eBay prices tend to be considerably lower.